This is a small utility that cleans up the registry in those cases where huge gaps of whitespace is displayed in the add/remove programs control panel applet. 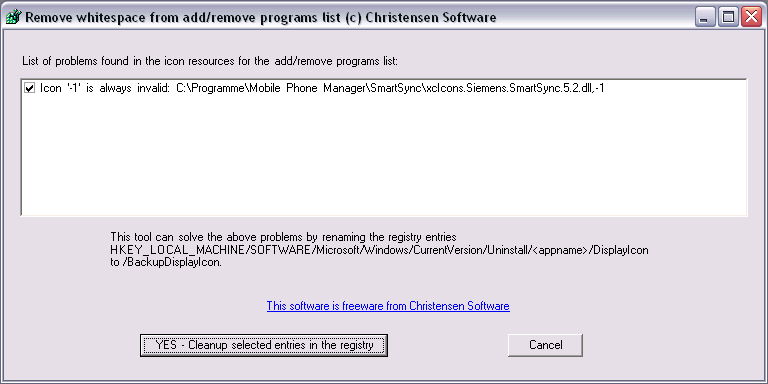 The gap is caused by a badly formatted "DisplayedIcon" entry in the uninstall area of the registry or a bad icon file. We read about the cause in Raymond Chen\'s blog and decided to write this tool that cleans up the registry entries. You can download, use and distribute it for free. XtraTools 2006 - a set of applications consisting of more than 20 independent system utilities that are complimentary to the standard MS Windows utilities. XtraTools increases productivity and makes working with MS Windows easier.